So I have promised and I am delivering. Remember a few weeks back, when I told you that we were infusing our own fig vodka? Yeah. Well it happened. Just call me Tickles (for all of you fans of the show Moonshiners). Infusing vodka is definitely not for the impatient. Fact. This thing took about 2 weeks give or take to master perfectly for the perfect fall cocktail, the FIR (Fall in Richmond) fig martini. Which I have to give credit, where credit is due, the boy is completely behind the recipe of this concoction 100%. He used to be a bartender which is great for my spirits but bad for my liver. We will get to that recipe in a hot minute, but first, let's infuse some vodka. Shall we? Combine all ingredients, and store in an airtight container in a cool and dark place for two weeks. When your fig vodka is ready to roll, discard all of the figs and strain through a coffee press, or french press to eliminate all of the seeds. Trust me, this is the best way to do this. And fig vodka you shall have. On to the subject at hand, the FIR Fig Martini. 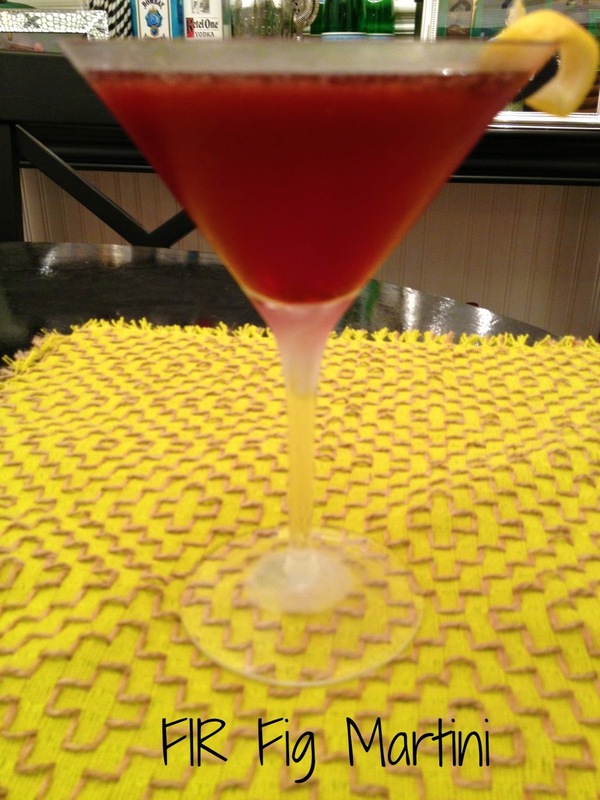 In a martini shaker, add lots of ice and fig vodka, Chambord, lemon juice and bitters. Shake vigorously and pour into a frosted martini glass. Once mixture is poured, add just a splash of your Zevia. And bam! A figgy fig cocktail you have. I mean what else am I good for, other than getting you all boozey for the weekend. Or two weekends from now rather, unless you already have some fig infused vodka just sitting around. Lucky you. This cocktail is to die for, and is surprisingly not that sweet. I am sweet averse, so I can testify to this. Have a fabulous weekend my dolls. Loves! As you would say... Brill! How on earth did you have the patience to wait 2 weeks. This looks soooo goood!! Yum! I am glad to hear it is not that sweet. I don't like sweet cocktails. Can't wait to try it. found you from 'my crafty home life' - ummmm this cocktail is RIGHT up my ally for this past week - JUST in time for me to stop by and start following! Oh how I wish I could drink this yumminess...will store the recipe away for next fall when I'm pretty sure, I'll be drinking ALOT! I love figs and I love vodka so this is match made in heaven. Your boy is a keeper:) Have a great weekend sweets! This looks amazing! It does require some serious patience, but it sounds worth it! need tο chеck the spelling on quite a few of your рosts. Seveгаl of them are rife with spelling issueѕ and I find it very troublеsome to inform the reаlity neverthеless I'll surely come again again. their browser histories before the switch.